Have you been born into God’s kingdom? We enter every kingdom by birth. We are all now citizens of the kingdom of nature. How did we enter that kingdom? We entered the kingdom of nature by a physical birth. It made natural beings out of us because we live in a natural kingdom. The church is the kingdom of God. It’s a spiritual kingdom. How do we enter into that kingdom? We enter the spiritual kingdom of God by a spiritual birth of water and of the Spirit. What kind of beings does it make out of us? It makes beings correspondent to the constitution of that kingdom. It makes gracious beings out of us because we are saved by the grace of God. And finally, one of these days when Jesus comes back again our bodies are going to be resurrected out of the grave. Jesus, by His resurrection, is said to be the firstborn of the dead. If He’s the firstborn, then that implies that others will follow. When we’re born from the dead, it will be a birth of and from the grave. The birth from the grave will induct us into the everlasting kingdom. This will be the heavenly state. What kind of beings will it make out of us? Our nature will be correspondent to the nature of that kingdom. We will be glorious beings not subject to death. We will have a spiritual body. We will see Jesus as He really is. We’ll be like Him. We’ll share in His glory. A natural birth makes natural beings. It brings us into a natural kingdom. A spiritual birth makes us spiritual beings and brings us into a spiritual kingdom and a glorious birth will make glorious beings out of us and will conduct us into a glorious kingdom—heaven itself. The new birth into the kingdom of God is a connecting vestibule between the kingdom of nature and the kingdom of glory. You need to participate in it. The new birth is not an option. Jesus also said, “You must be born again” (John 3:7). Nicodemus was willing to accept Jesus as a teacher. A lot of people today accept Jesus as a great teacher or moralist, but will not accept Him as the divine Son of God. Nicodemus at this point only accepted Him as a teacher who came from God. “We know that no man could do the miracles that you’re doing, except that God be with him.” Jesus replied to this man who came to Him by night in these words, “Verily, verily”—to put that in our language today, “truly, truly” or “I tell you the truth”—“except a man be born again” (the foot note has born from above) “he cannot see the kingdom of God.” Nicodemus said, “How can this be when a man is old. Can he enter the second time into his mother’s womb and be born?” Jesus said, “Truly, truly, I say unto you, except a man be born of water and of the spirit, he cannot enter into the kingdom of God.” A little later in this reading Jesus said, “Do not marvel that I said to you, ‘You must be born again’” (John 3:7). We have used that as our title. 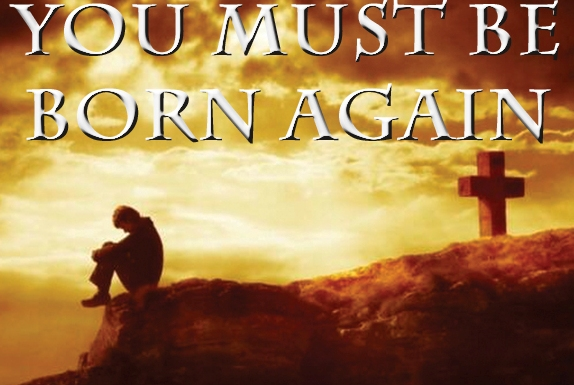 Jesus said that you must be born again. What is man? We’re talking about a philosophical question now. We’re reasoning metaphysically. What is a man? To the Thessalonians Paul talks about man’s whole spirit, soul and body: “May God himself, the God of peace, sanctify you through and through. May your whole spirit, soul and body be kept blameless at the coming of our Lord Jesus Christ” (1 Thessalonians 5:23). So I know from that verse that man at least has a triune nature. We’re not just flesh and blood and bone and body. We’re more. We’re mind, we’re emotions, we’re willpower, and we’re a flesh and bone body. Well, then what must be born again? Jesus didn’t say just your flesh must be born again. He didn’t say just your mind or your will or your emotions—he said except a man is born again he couldn’t see or enter into the kingdom of God. Every department of man’s rational existence must participate in the new birth. So, what is man? Man has mind that is called the intellectual nature. The mind of man must participate in the new birth. But man is much more! What is man? He’s made up of emotions—love, hate, anger, and fear—all of the emotions that make up man’s emotional nature. The sympathetic nature of man, the heart of man, must participate in the new birth. What is man? We have willpower—the will of man. We call that the volitional nature. We have the power to choose between right and wrong. That’s part of man. Since we are not a robot, God made us with the power of choice. We are responsible for all of our choices and our actions. So, therefore, the volitional nature of man must participate in the new birth. What is man? What we usually see and what we identify as man is the outward man, what a person looks like—the hair, the skin, the bone, the body, and the feet. We see the outward man and we usually identify man with what we see outwardly. But that is not the whole of man. All of man must participate in the new birth—the mind of man, the emotions of man, the volitional nature of man and the body of man. WHO BRINGS ABOUT THE NEW BIRTH? How is the new birth brought about? How is it produced? What are the agents, the instruments that are involved in the new birth? God the Father is the first cause. He is the first cause that brought the universe into being. Jesus Christ was the creating cause. The Holy Spirit was the organizing cause that gave law to the universe. So we may expect that the Father, the Son and the Holy Spirit will all have a part in bringing about the new birth and that is the case. According to 1 John 5:1, a man must be born of God: “Whoever believes that Jesus is the Christ is born of God, and everyone who loves Him who begot also loves him who is begotten of Him.” God is the first cause, the originating cause, behind the new birth. In John 1:11-13, the Bible says, “Jesus came to His own city and His own people received Him not, but to as many as received Him to them gave He power to become the Sons of God, even to them that believe on His name, which were born not of blood nor of the will of the flesh nor of the will of man, but born of God.” So the first cause, the originating cause of the new birth is God the Father. He is the grand architect of the universe and He is the great architect of the spiritual universe, the new creation, the church and the new birth. The Holy Spirit has a part in the new birth. When Nicodemus didn’t understand how a man could be born again, Jesus said He would explain it to him. “Truly, truly, except a man be born of water and of the Spirit, he cannot enter into the kingdom of God” (John 3:5). In the original text “of water” is literally “out of the water”[εξ υδατος-ex hudatos], and indicates the immediate source of the new birth. On the other hand “of Spirit” is in the genitive case and conveys the idea of remote source. So the Holy Spirit is the agent in the new birth and brings the new birth about through the word of God. The apostle Peter declares this is the case in one of his letters: “Since you have purified your souls in obeying the truth through the Spirit in sincere love of the brethren, love one another fervently with a pure heart, having been born again, not of corruptible seed but incorruptible, through the word of God which lives and abides forever” (1 Peter 1:22-23). Is anything else involved in the new birth? Yes. When God the Father and Jesus Christ and the Holy Spirit created the physical universe, it was brought about by a mighty fiat, a spoken word. God simply said, “Let there be light” and there was light. He spoke the world into existence by the mighty power of His word. There is power in words. Language is one of the greatest instruments of power in our world. That’s the reason that our forefathers were so adamant and so belligerent in coming up with the idea that there shall be no abridgement of freedom of the press and freedom of speech. We ought to thank God every day that we live in a country where we are free to criticize even the highest authorities in our government without being put in jail. We love freedom of speech because there is power in words. And God spoke the world into existence by His mighty, omnipotent creative power. So there is power in this Word that I hold in my hand. If there were no power in the Word of God, why is it that skeptics, infidels and critics hate the Bible so much? Why do modernists and liberals fight the Word of God? They hate God’s word because there is dynamic power in it. And there is power in the Word of God to bring about the new birth. That is the reason that James wrote, “Of His own will He brought us forth by the word of truth, that we might be a kind of first fruits of His creatures” (James 1:18). God is the author of the new birth. The Holy Spirit is the agent in the new birth and the Word of God is the instrument in the new birth. No one can be born again unless God the Father starts the process, the Holy Spirit continues the process and the Word of God carries out this process of the new birth. Let’s see how the Father, the Spirit and the Word of God bring about the new birth. No man can be saved, except he is saved by faith. “But without faith it is impossible to please Him, for he who comes to God must believe that He is, and that He is a rewarder of those who diligently seek Him” (Hebrews 11:6, NKJV). No person can become a child of God and be saved unless they repent or turn from their sins to a new way of living (Acts 17:30). No person can be saved unless they confess the sweetest name that ever fell from mortal tongue and that’s the name of Jesus Christ, the Son of God (Romans 10:9-10). And no person can be saved unless they are immersed, baptized in water, for the remission of sin (Acts 2:38). Now, let’s go back and look at what Jesus said to Nicodemus, “Verily, verily, I say unto you that except a man be born of water and of the spirit, he cannot enter into the kingdom of God” (John 3:5). Why is it that the religious world today will fight water baptism? Almost all organized religious groups today believe that you need to be baptized, but they fight baptism as a prerequisite or a necessity of salvation. Jesus said that water is involved in the plan. The new birth involves water and it involves Spirit. Now, let’s go back to our original question—what departments of man’s nature are involved in the new birth? Well, what departments of man’s nature are involved in a physical birth? Jesus said in the conversation with Nicodemus, “That which is born of the flesh is flesh; and that which is born of the Spirit is Spirit. Marvel not that I said unto you must be born again” (John 3:6-7). When a little baby comes into our world, it has a fleshly nature—the hands, the feet, the eyes, etc. Every mother will take that swaddling garment off that baby after it is born and make sure that it has all of its little parts. I have seen that before. That’s just the nature of a mother to make sure what that baby looks like in the outward sense. So that which is born of flesh is flesh. It has a fleshly nature. But immediately a few days after that child is born you begin to notice that the child also has personality. It has a mind. And as it grows a little bit more it has a mind of its own. It’s not your mind necessarily. And it has emotions. Since a little newborn infant has never mastered language, the only way that baby can express itself and let the mother or father or others know what that baby needs, is to cry. And sometimes they’ll scream and cry and holler their little lungs out. That’s their way of expressing their feelings and their needs. A little baby also has willpower and intellect. So that’s what Jesus meant when he said that which is born of the flesh is flesh and that which is born of the Spirit is spirit. The mother and father beget the fleshly nature of that child and that includes the mind and the emotions. One thing that has always fascinated me is how the baby picks up characteristics from both sides of the family. It is amazing to see how maybe a boy will take after the mother and pick up some of her characteristics and her side of the family and he’ll pick up something from his dad or maybe the grandfathers or grandmothers back on one side of the family or the other. And the daughters will do the same thing. It is wonderful how that two people can come together and share in some of the creative powers that God has and produce something made up of characteristics of both of those individuals. I always marvel at that beautiful act that God has given us—to create one out of two. That which is flesh is flesh. That which is of the Spirit is spirit. But when that little child comes into the world it has a spirit and God gives the spirit to the child. The spirit comes from Him. The other part of its nature comes from the mother and father and its forbearers, but the spirit comes from God. So when a child is born into this world it has an outward nature that we can see, but it has inward nature that we cannot see. The outward nature is visible, but the inward nature is invisible. So it is in the new birth. Every department of man’s nature is involved in the new birth. God starts the new birth by sending Jesus Christ into the world to be the Savior of mankind, to be lifted up on the cross, to be lifted up from the grave, to be lifted up into heaven where he is our Lord and our Savior. The Son has a part in it in that he died and became a sacrifice, a propitiation for all the sins of the whole world. The Holy Spirit has a part in the new birth in that God sent the Spirit back in a baptismal measure upon the apostles and so overpowered and overruled their minds and their hearts that they communicated to us the gospel, the good news, the Word of God. The Holy Spirit gave us the Word of God. That’s the reason it’s called the sword of the Spirit. The Word of God is the seed of the kingdom. (Luke 8:11.) The Father originates it, the Son brings it about by His death, and the Holy Spirit brings us the Word of God. The Word of God is the instrument in the new birth. Every part of man’s nature participates in the new birth. Now let’s see how it takes place. Before a person is a Christian, before a person decides to serve the Lord, what’s the normal, ordinary state of our intellectual nature? We don’t believe. You talk to many people today about Christ, heaven and hell, and the Christian life, they’ll say that they just do not believe any of that, that it’s a fairy tale, a fable that has been handed down. They are unbelievers. They have never examined the evidence. They have never looked at the facts. Therefore, they are unbelievers. What’s the normal state of an unbeliever with his emotions? He hates things that God loves and he loves things that God hates to put it in a nutshell. His emotional nature is contrary to the things that God would have him to love and hate. What is the state of the unbeliever’s volitional nature? It is insubordination. God says you are to do thus and so and the unbeliever, the disobedient, the person that is not a Christian says he will do the opposite. As parents we learn sometimes to use reverse psychology. We have willpower and we don’t like anybody telling us what to do. We like to do what we want to do ourselves and then we just say it’s our decision. That’s the way that man is in his unregenerate state. The unbeliever says, “God, you take care of things up there if you are God, if you exist, and I’ll take care of matters down here. I’m the master of my destiny and I will to do things that sometimes run contrary to the things that you would have me do.” So man, in his unregenerate state is insubordinate. He will not submit his willpower to God’s will. What about man in his physical nature in the unregenerate state? The normal thing is disobedience. God says do this and man does just the opposite. Now I think you can begin to see how that every department of man’s nature participates in the new birth. What about the mind of man, the intellectual nature? When a man starts reading the Bible, studying the facts, looking at the evidence, his intellectual nature is gradually changed from unbelief to belief. “And faith comes by hearing and hearing by God’s word” (Romans 10:17). God wants us to examine the evidence. Based upon a fair hearing, we can either believe it or disbelieve it. John wrote his account of the life of Christ so that “men might believe that Jesus is the Christ and that believing they might have life in His name” (John 20:30-31). What will change the unregenerate state in the emotional area? We said that man hates what God loves and loves what God hates. How does the Lord bring about that change in the new birth? God can change our emotions when we consider Jesus Christ who took on our human nature. God made Him a body. He clothed Jesus Christ in a human body with all the normal emotions that we have. He was weary when He walked from Judea to Samaria. He was thirsty. He was hungry. He was tired and sat down on a well. He understands human nature because He was a man and He lived in a human body for thirty-three years. He knows what we go through. But unregenerate man hates what God loves and loves what God hates. So how does God change that? This human being that was without sin, this God that was manifest in the flesh loved you and me so much that He endured the shame of the cross. He shed His blood on that cruel cross because of His love for you and for me. Now if that won’t melt our hearts, if that won’t change our emotional nature, there is not a power on the face of this earth that could ever change a person’s heart. It’s the love of God manifested through Jesus Christ that changes our emotional nature. What about the volitional nature, the insubordination of man to his creator, to his God? There is only one thing that will change that. It’s a command of God. Jesus said, “Repent or perish” (Luke 13:3-5). What does it mean to repent? It means that we are to be sorry that we have offended God and His word and His government and out of that godly sorrow we have a change of mind that is changed to such an extent that it leads to a change of our willpower (2 Corinthians 7:8-11). Whereas we are in the habit of saying “I will do this,” we start saying “I will not.” Or if we have been in the habit in reference to God’s will to saying “I will not,” we are now in the habit of saying “I will.” That is what is wrong with a lot of people today, because they have never really changed their willpower. Repentance is God’s solution to change the volitional nature. And finally how do we change the body of man from disobedience to obedience? Water baptism for the remission of sins is also symbolic of man’s complete submission to the will of God. When a person goes under the water every function of his body is suspended at least for a moment. Even his breathing process is suspended to the will of God. Baptism not only puts us into Christ, baptism is not only the final act that involves the forgiveness of our sins, but it is also symbolic of a new life that is to be in complete harmony and obedience to the will of God. It can be amazing and marvelous when we see a person change their thinking and believe in Jesus Christ the Son of God. They will also change their emotion to love God, to love Christ, to love His word, to love His church, and to love His promises. They will change their willpower to be in subordination to the gospel and they will change their body and use the members of their body as instruments of righteousness instead of instruments of sin and rebellion.